Boosting ecommerce sales through online channels can be tricky. Your business faces increasing competition from online retailers and shrinking customer attention spans. Many businesses rely on seasonal promotions to boost sales. They can generate significant revenue, but holiday ecommerce marketing is tough. Consumers are bombarded with ecommerce emails and ads on a daily basis. If you want to earn your prospects’ money, you need to stand out against thousands of competitors. You don’t have to let the calendar dictate your sales. Check out these four ecommerce promotion ideas that will generate profit year-round. During a flash sale, an ecommerce business offers specific products for a limited time at a deep discount. Flash sales are a good way to generate hype for excess inventory or make room for new products, all while offering value to your customers and bringing in quick revenue. Flash sales create a sense of urgency and exclusivity. Customers don’t want to miss out on deals that might not happen again for a while. Flash sale emails also boost open and click-through rates and conversion rates. Since the promotion time is short, you can plan multiple flash sales throughout the year. Make sure your website and inventory are prepared to handle the sudden spike in traffic. Summer is a historically slow season in the retail world. But you don’t have to let the summer blues slow your revenue stream. Christmas in July began as a European tradition. The blistering summer heat made people miss the gift-giving spirit of Christmas. It quickly morphed into a retail holiday. Companies started imitating Christmas festivities and extending deep discounts generally reserved for the holiday season. You won’t have to fight for real estate in your contacts’ inboxes in the middle of the summer and it’s a great way to boost lackluster summer sales. Retail giants like Amazon and Walmart have started pushing Christmas in July promotions. But don’t let that fool you into thinking the holiday isn’t profitable for smaller ecommerce brands. 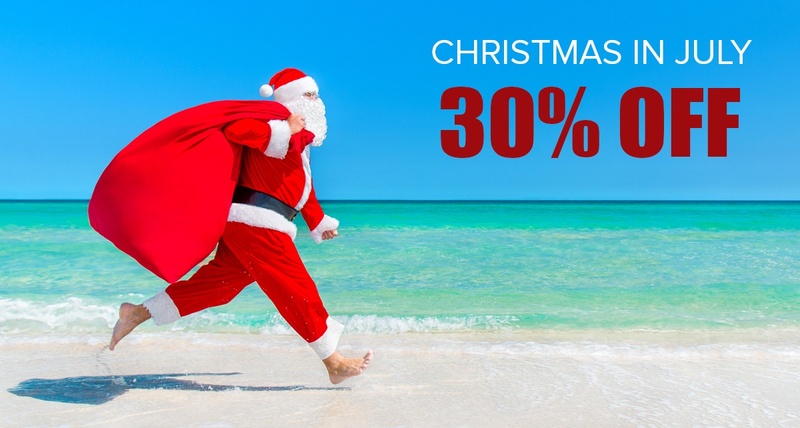 We ran a Christmas in July promo for one of our ecommerce clients last year. We planned a two-day sale with the highest discount we had ever offered. As a result, we generated the most revenue on a single day in the client’s company history. Humans are curious by nature. There’s no better way to pique your customers’ interest than a mystery sale. During a mystery sale, you offer a secret discount that the customer doesn’t see until they click through to your site or begin the checkout process. Using smart CTAs and modules, you can assign different discount amounts to customers based on their purchase history or behavior. Even if a customer isn’t in the market to make a purchase, a mystery sale provokes them to investigate what kind of discount they’ll get. Once you get those customers on your website, they’re one step closer to making a purchase. Each contact that visited the site saw a personalized banner that revealed their discount amount. If a visitor on the website was not a contact and hadn’t made a recent purchase, they would see a default discount of 15 percent. The mystery sale increased our email click-through rate by 200 percent. If you’re stuck in a creative rut, try capitalizing on an unusual national holiday. Businesses are finding ways to profit from unconventional holidays from National Pizza Day to Talk Like a Pirate Day. Don’t be afraid to build promotions around random holidays that have nothing to do with your product. J. 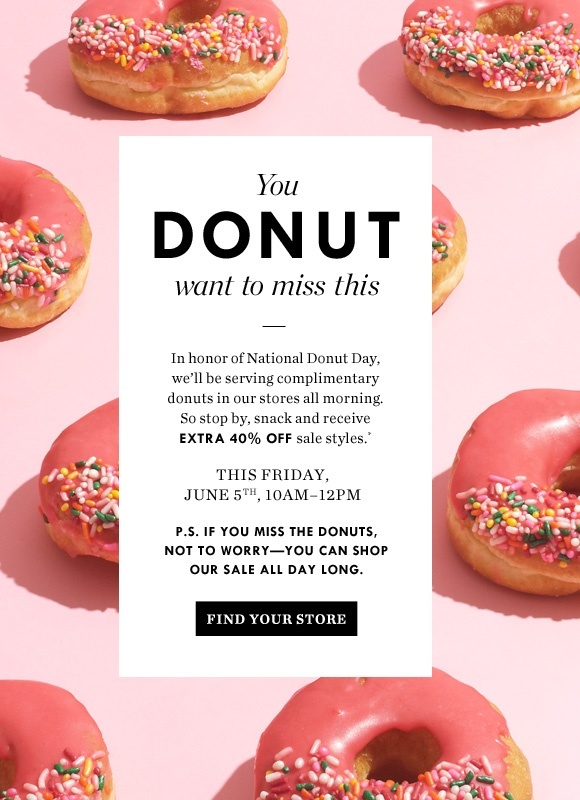 Crew advertised National Donut Day by serving complimentary donuts in all their stores on June 5th. They also offered a 40 percent discount on sale items to celebrate the occasion. Fashion is pretty unrelated to donuts, but free food was an excellent incentive to get people into the stores and spending money. Customer loyalty rewards originality. If you can attract and delight customers with original promotions all year round, they’re more likely to spend money with you during big retail holidays. Repeat customers also spend 25 percent more per transaction during the busy holiday season (November and December). Successful promotions provide value to your customers while generating profit. Your business consistently needs to implement new tactics to increase your lifetime customer value and stay competitive. Ecommerce meme Copyright © 2019.